Formaldehyde in its main forms such as formalin (formaldehyde aqueous solution) is daily used within laboratories involved in the manipulation of tissues such as anatomy-pathology or histology. Highly toxic, mutagenic and carcinogenic this molecule presents considerable risks to the health of workers who must be protected from the risk of inhalation. The simple opening of the findings containers, the purging of formalin solution for filling or the sectioning of findings are just some of the typical operations that lead users to the risk of inhalation of formaldehyde vapors. 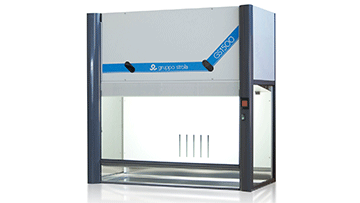 The Gruppo Strola, with over 30 years experience in fume hoods manufacturing, proposes solutions especially designed for formaldehyde-vapors containment to reduce the risk of harmful inhalation during findings-handling operations. Our fume cupboards are equipped with specially designed and tested aerodynamic edges to allow maximum containment without losing comfort and ergonomics. Thanks to the presence of an internal back-baffle even heavier molecules can be brought effectively towards the suction plenum, ensuring effective uptake of the vapors directly at the origin. Finally, to ensure maximum effectiveness of the uptake in the cutting zone, this is equipped with its own down-draft ventilation which allows it to locally capture formaldehyde vapors. The filters installed on our fume cupboard are made with top-quality activated carbon and specially impregnated for retention of formaldehyde. Their efficiency has been demonstrated to be above 99.5% (ref. BS7989: 2001). The presence of a double filtering stage (1st prefiltration, 2nd main filtration) allows to separate the environmental particles that may prematurely occlude the main filters. Finally, thanks to the use of a powerful fan we are able to provide ductless fume cupboard that can be even connected directly to an exhausting system without the aid of expensive remote blowers. Our fume cupboard for handling of specimens under formalin can be configured according to specific operators’ needs installing accessories especially designed as sinks, cutting area, video capture systems, shelves door samples or video recording systems. The worktop can be manufactured according to the operators’ needs placing in different position drip-cups, sinks and taps. The filtration system installed on fume cupboard for the handling of formaldehyde is completely adaptable to the requirements of use and has been designed for use with this specific substance. It is characterized by a first pre-filtration stage with M6-class filters that remove environmental particulate, then a main filter unit made with impregnated activated carbon specific for the retention of formaldehyde that retains this dangerous molecule allowing the total recycling of the laboratory air without affecting air-handling units. It is even possible to install active-carbon secondary filters so as to extend the range of use and the containment also to vapors of substances in liquid phase occasionally used. 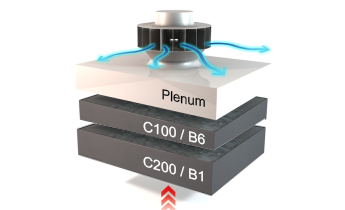 The modularity is made possible thanks to the use of HEPA filters and activated carbon filters of different thicknesses (100mm, 60mm and 40mm) and installing different activated-carbon types based on the type of molecule to be retained. Some filtration-system layout examples are provided below. 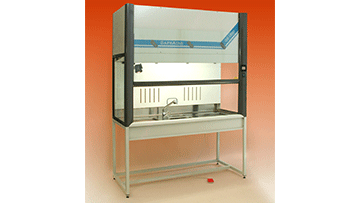 Filtration fume cupboard especially designed for formalin-fixed specimen handling. Four dimension available: 1000/1200/1500/1800. Provided with special customized worktop and based on the specific user’s needs. Usable with or without an exhausting connection, but with embedded filters. 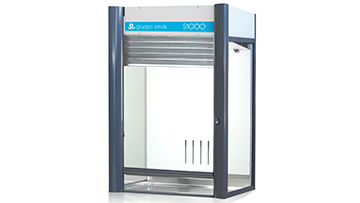 High performance filtration fume cupboard available in four dimensions 1000/1200/1500/1800. Highly customizable with different accessories. Usable with or without an exhausting connection, but with embedded filters. Filtration storage cabinets for formalin-fixed specimens. Available in two dimensions 1000/1200mm. Usable with or without an exhausting connection, but with embedded filters. 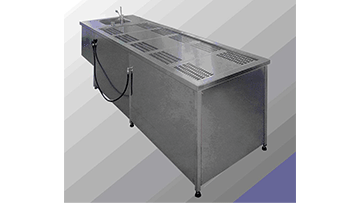 Down-flow benches for formalin-fixed specimens handling available in two different dimensions and two different versions (with or without sinks). Highly customizable and equipped with its own blower and filtration system with impregnated activated carbon for formaldehyde retention. Usable with or without an exhausting connection, but with embedded filters. Ducted fume cupboard available in four dimensions 1000/1200/1500/1800 working with an exsting ventilation system. 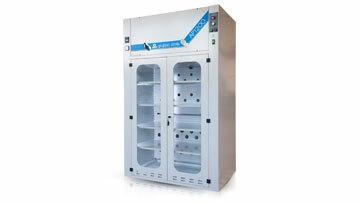 CAV (constant-air-volume) type fume cupboard that does not need any complex control system. They feature high reliability and durability. Highly customizable through many available accessories and dimension personalization to best fit user’s need. The Gruppo Strola is involved for over 30 years in the design and implementation of solutions for the containment of vapors / toxic molecules released during laboratory manipulations. Thank to our experience with projects accomplished in Italy and all over the world and a constant research for advanced technical solutions, we are able to produce solutions against chemical hazards in the laboratory for maximum protection of operators.